To maintain the economy in a “2 degree” trajectory, it is vital to redirect savings towards companies and projects promoting energy transition. Philippe Zaouati, Head of Mirova explains: “The energy transition can only succeed if we manage to mobilise private investors’ savings. The success of COP21 therefore also depends on the ability of asset management firms to propose solutions in response to the climate challenge, whilst delivering the returns expected by investors”. In response to growing demands on investors to make greener investments, Mirova, in partnership with the leading carbon strategy specialist consultant Carbone 4, has developed an innovative methodology to measure the carbon footprint of an investment portfolio. This decision-making tool assesses a company’s contribution to the reduction of global greenhouse gas emissions (GGE). Hervé Guez, Head of Mirova Responsible Investment Research, comments: “Measuring the overall impact of a business on the environment is an essential step towards acting against global warming. Assessing the carbon footprint is therefore an indispensable stage in the construction of portfolios contributing to energy transition”. 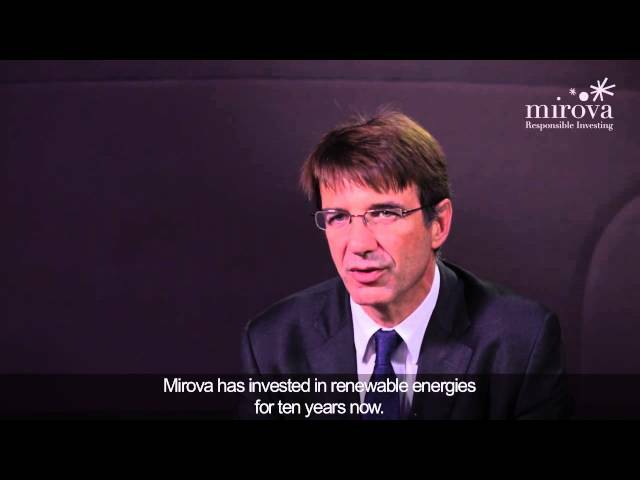 For more than 10 years now, Mirova has provided European institutions with access to investments in project companies based on renewable energy assets in France and Europe. Mirova’s renewable energies funds, including its latest launch, Mirova Eurofideme 3(1), have generated 730 MW of new production capacity and contributed to avoiding 1.4 million of CO2 emissions. Mirova was one of the first asset management firms in the world to launch a green bond product: Mirova Green Bond – Global(2). By financing tangible assets and ensuring transparency regarding the deployment of the capital raised, green bonds enable issuers to diversify their investor bases, while enabling investors to actively participate in financing the energy transition. Mirova proposes fundamental conviction-based asset management covering European and global equities, focusing on companies providing sustainable development solutions. Mirova Global Transition Energy Equity Fund(3) invests worldwide in companies offering products and services aiming to reduce greenhouse gas emissions. 1 Mirova Eurofideme 3 is open to subscription only for well-informed investors. This fund is not subject to approval by the AMF or a regulatory authority. This fund incurs a risk of loss of capital. 2 Mirova Green Bond Global is a French SICAV (open-ended investment company). This fund incurs a risk of loss of capital. 3 Mirova Global Transition Energy Equity Fund is a Luxembourg sub-fund of the Mirova Funds SICAV (open-ended investment company). Investing in this sub-fund incurs a risk of loss of capital. (1) Source: Mirova – 30/06/2015. 2 Sources: Natixis Asset Management - Natixis Asset Management Asia Limited as of 30 June 2015.